Miriam Margoyles is a talented character actress with a penchant for stealing her co-stars' thunder in her films. From teaching Herbology at Hogwarts School of Witchcraft and Wizardry, she's been promoted to Headmistress of Shiz University. Ms. Margoyles has made her Broadway debut as Madame Morrible in Wicked. Read her funny interview on Broadway.com here. She said she's "66, old and fat and thought Broadway musicals didn't seem to quite fit the bill." 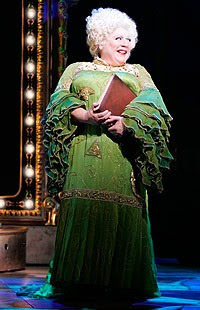 She did play Madame Morrible in Wicked's London production.